Ever wanted to learn the Jedi kicks and punches? All movies use Martial Arts as a base training. See your new techniques learnt in class on the big movie screen and tell your friends you can do that, they will be very impressed! Remember its all in the training. Our Martial arts pledge starts with ‘to set positive goals and strive to achieve them’ this is a reminder to all parts of our life. Achieving a Black Belt can be as fast or as slow as you want. 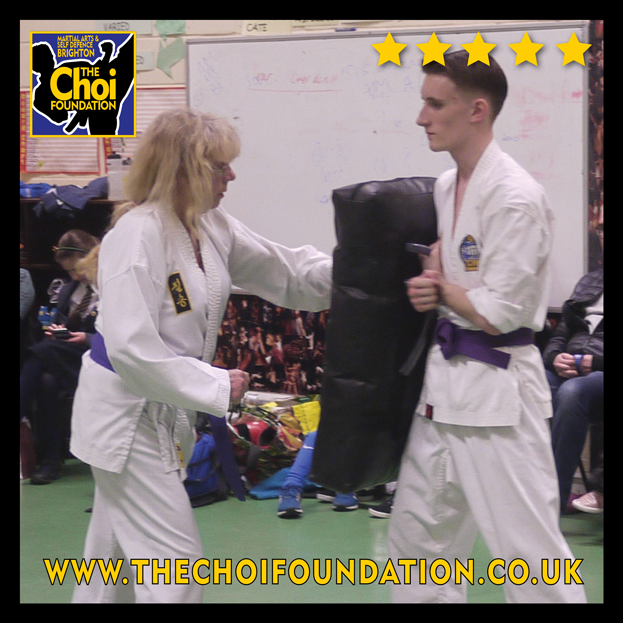 Grading for a new belt is every couple of months and its very satisfying to tell all your friends and family you have achieve another colour towards your black belt. Contact Robert here to book your FREE trial class today! 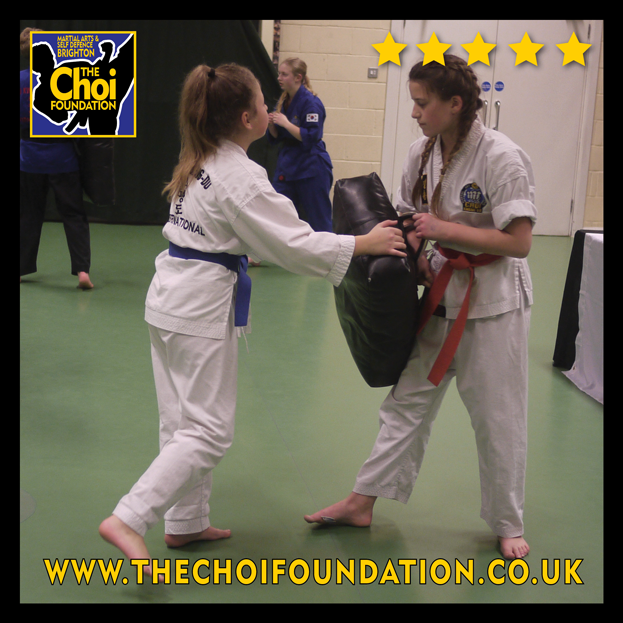 We have female students from all walks of life and fitness levels in our class, come and try a free class to see how much Martial Arts is like dancing. Learning a set of moves and stances. Once you have learnt a Martial Art pattern (combination of techniques), fitness can be practised anywhere. 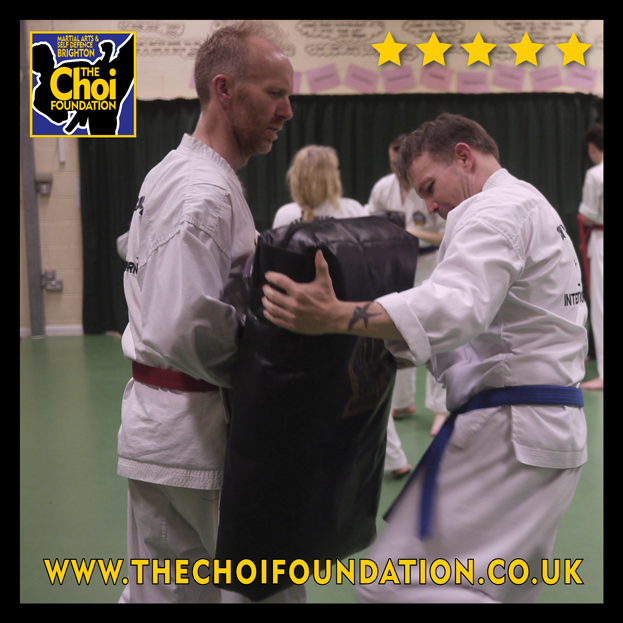 Plus our self-defence teaches you how to get comfortable in uncomfortable situations. 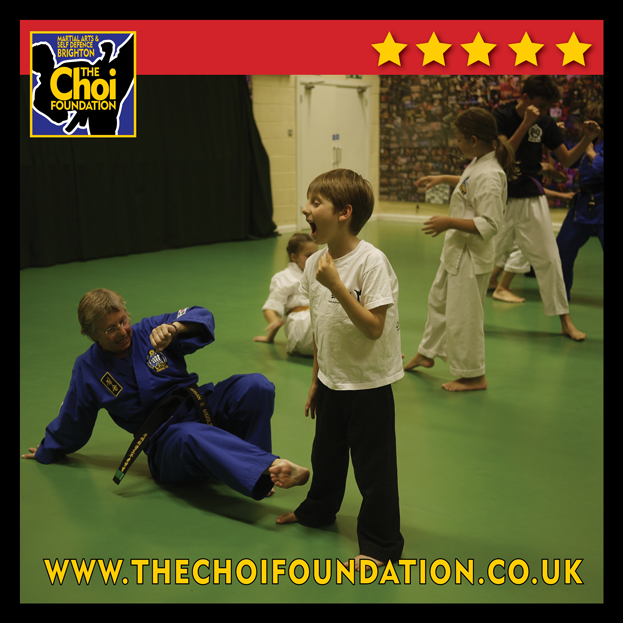 Make new friends at any age, learn Martial Arts and have fun with kids, teenagers, adults, middle aged and OAP’s. 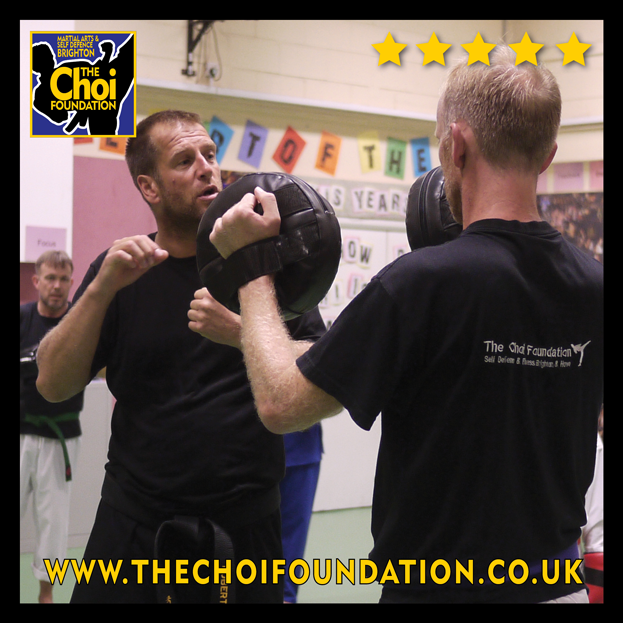 Build up your confidence to talk to anyone at our Martial Arts mixed classes. 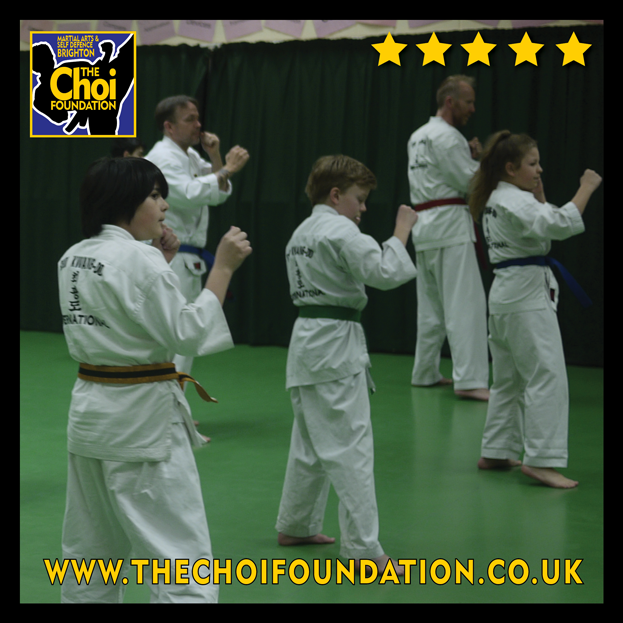 Kids teach adults, adults teach kids, great fun and fitness for everyone. Our training is based on individual needs, capabilities, skill levels and age. Our students range in years from 3 to 90, and some of our instructors are over 70. Since our primary goals are to prevent or reduce illness and disease and to promote optimum health and longevity by minimizing degeneration of body and mind, we also welcome those with limitations. 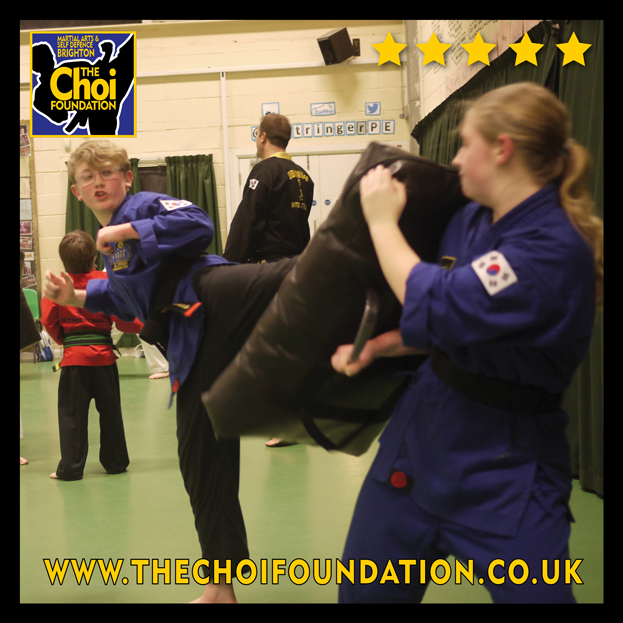 Everyone is welcome at Choi Kwang Do. Try a FREE class and learn a new sport. Learn how to fight off those winter blues. Martial Arts if about self-defence and exercises for both sides of the body. It is fitness for all ages and abilities. Learn Martial Arts at your own pace and strength. Our younger students still find time to come to class during mock exams, the perfect stress relief for anyone. Get away from stressful family and friends. Concentrating on something completely different after a long day of revising is a perfect way to feel better. See our Classes page for days and times. 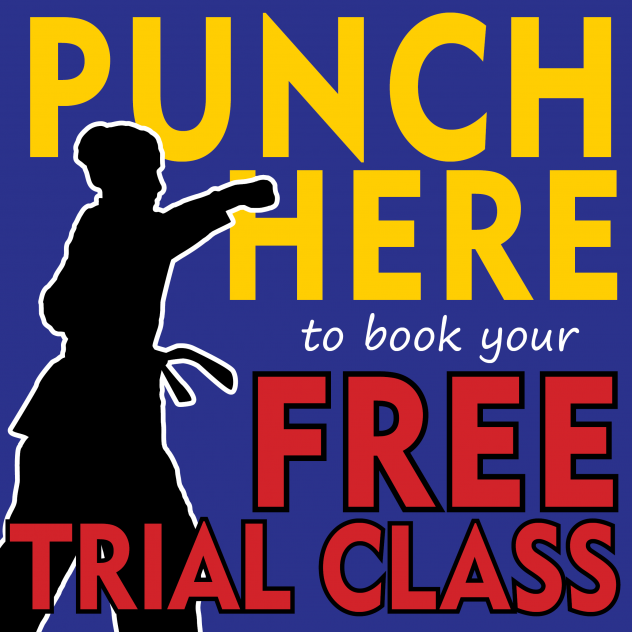 Contact Robert here to book your FREE trial class today! Please email Robert to purchase your gift voucher. Payment can be made by Paypal or bank transfer. You will receive an voucher by email to print or forward on. 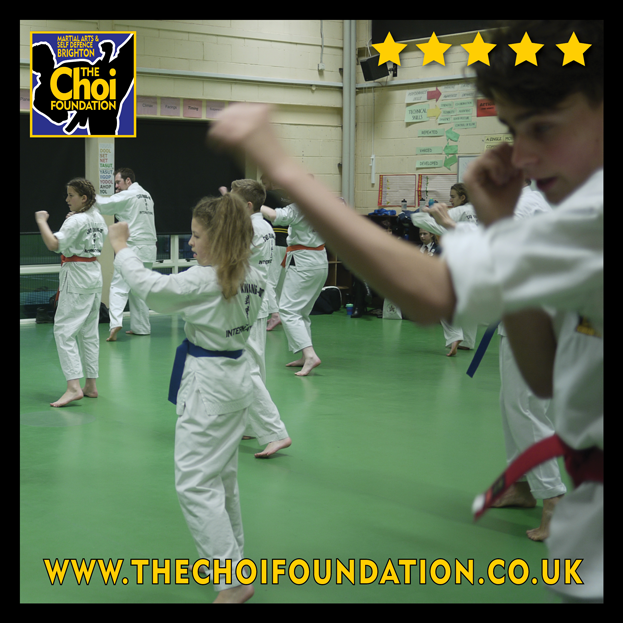 Martial Art classes for all ages and abilities. Lean new skills, have fun and make new friends. 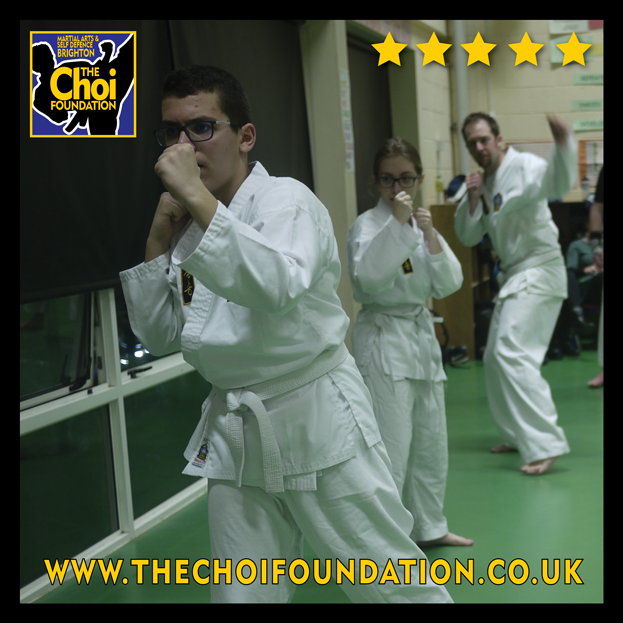 The Choi Foundation Martial Arts classes are at Dorothy Stringer on Monday and Thursday evenings. 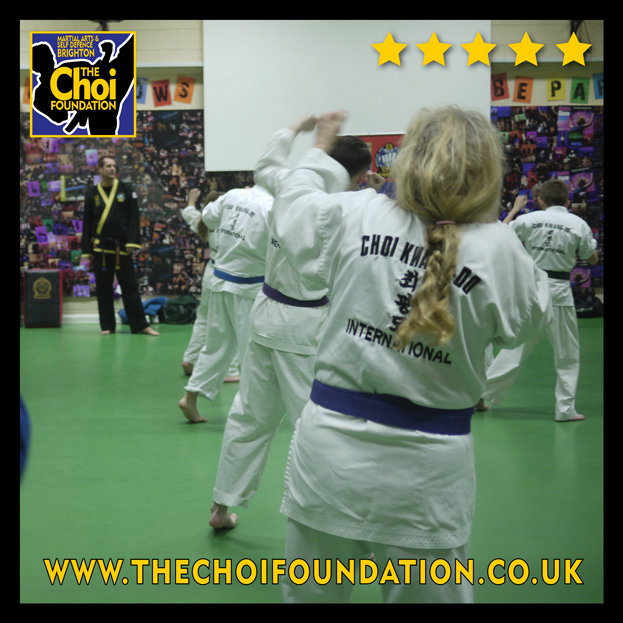 See our Classes page for times, prices and a map. Contact Robert here to book your FREE trial class today! Give a gift with a difference for birthdays or Christmas? Do you have someone who is difficult to buy for? Mum, dad, brother, sister, auntie, uncle, Grand ma or Grand dad. 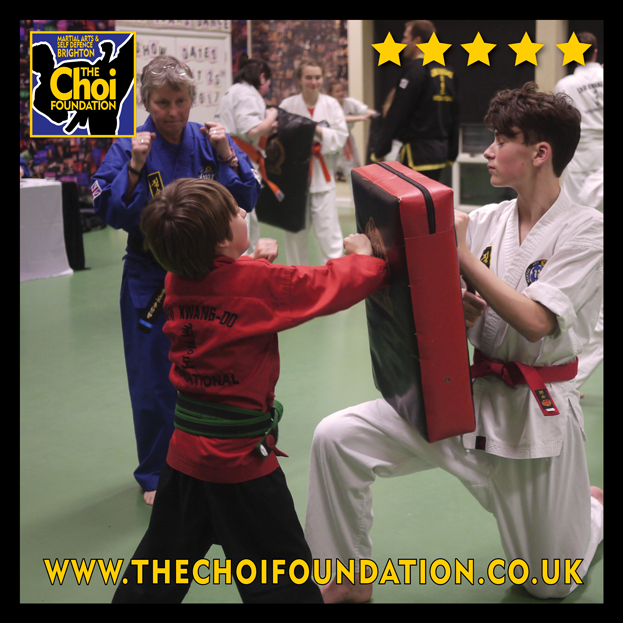 Martial Arts is a fitness for all ages and abilities, it can be as easy or as challenging as you make it. One day they could be a Black Belt! 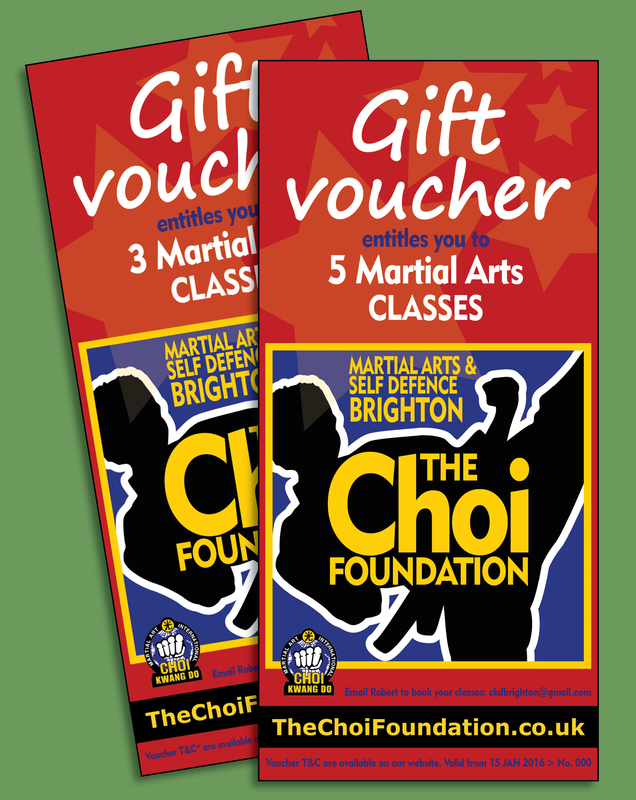 Voucher T&C: The Choi Foundation Martial Arts classes gift voucher is only valid three months, for the chosen person, from the date shown. Classes are to be used consecutively to really enjoy the experience. Every voucher has a unique number and should be quoted at the time of booking your first class. This voucher cannot be used with any other promotions or exchanged for cash. 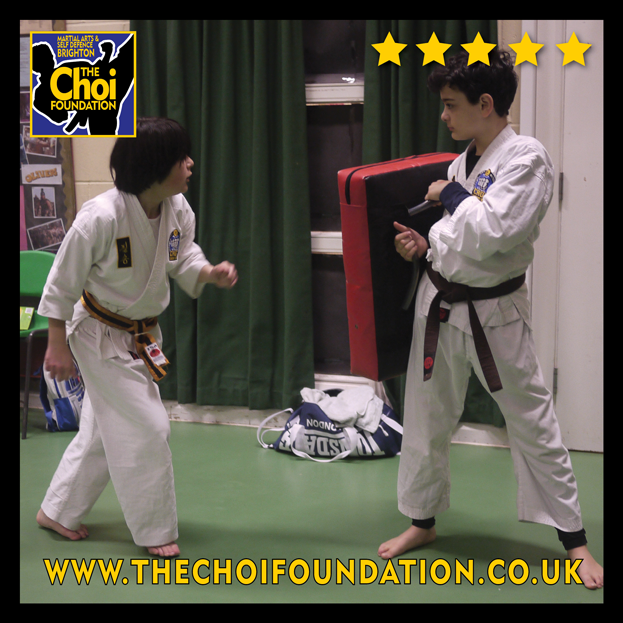 Martial Arts classes help brings siblings together instead of wanting to hurt each other, they learn respect and control. Releasing built us physical energy in a controlled fight. Why not bring Mum and Dad too. 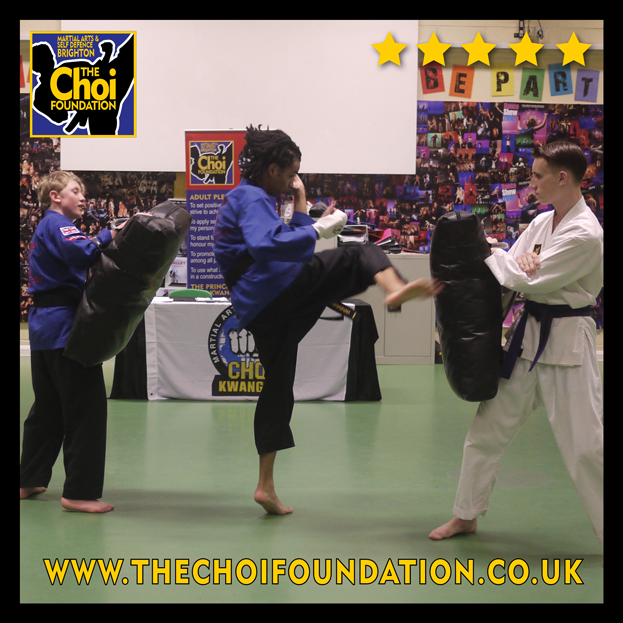 The main reasons for becoming a student in Choi Kwang Do is to achieve optimum health, to learn practical self-defense and for personal development purposes. 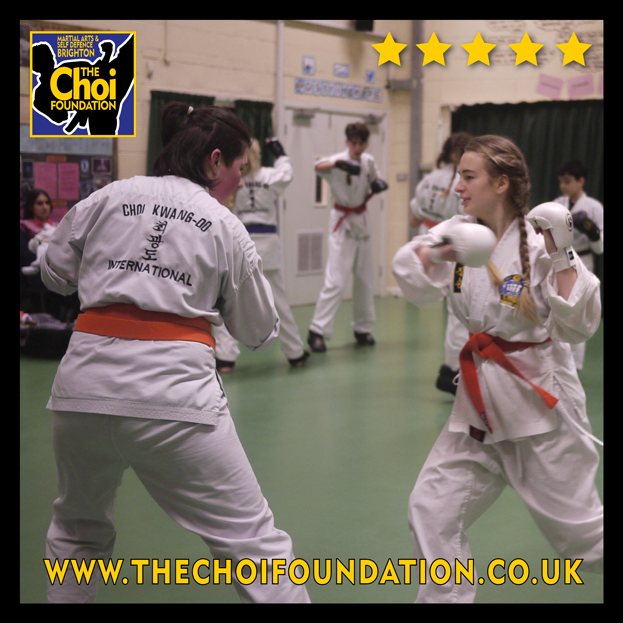 Within two weeks of joining a Choi Kwang Do school, students often experience a greater feeling of physical and mental well being than they have ever experienced before. Students can test every 2 months for their next belt (from White Belt to 1st Degree Black belt). 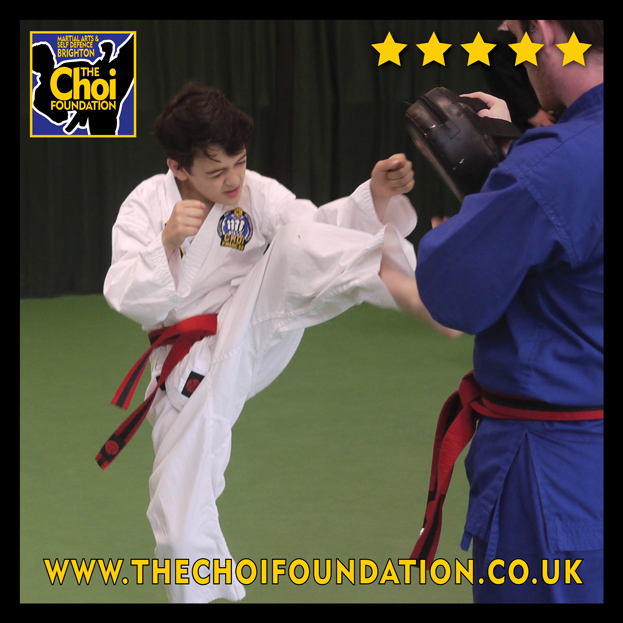 Choi Kwang Do always offers you something new and challenging to learn, experience and enjoy. Grading always brings a sense of achievement to all students, young and older. 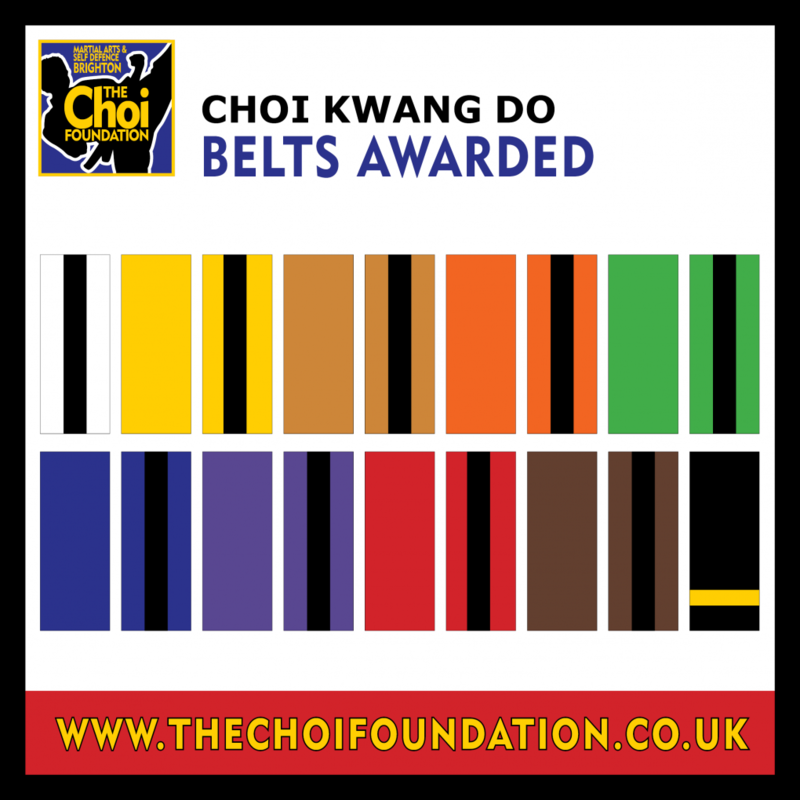 Martial arts use the coloured belt system to rank students, although colours and rankings can vary greatly among disciplines. In general, white belts signify beginners, brown belts represent intermediate students, and black belts are given to masters, with other colours in between. There is a new set of techniques, e.g. 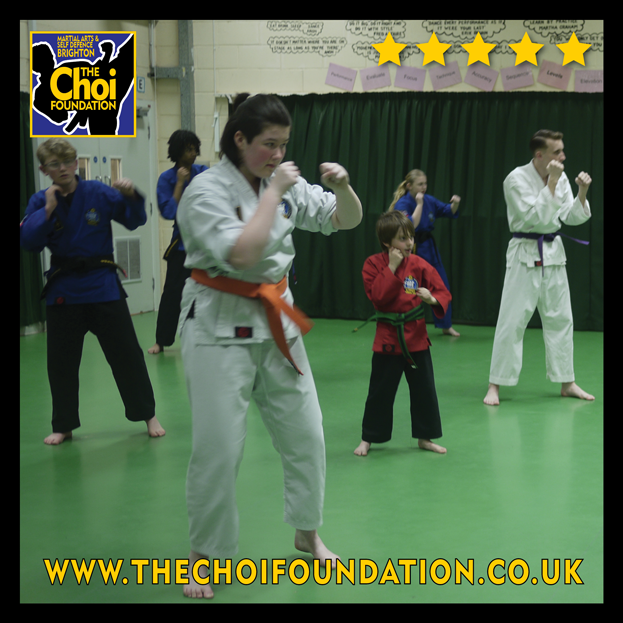 punches and kicks, for each colour belt becoming more difficult as you move up through the belts. Learn to fight like Bruce Lee. There is no lycra in our fitness classes. See all our wonderful reviews from students and parents. Or come to a trial class for FREE and see for yourself. Contact today Robert through our email form. 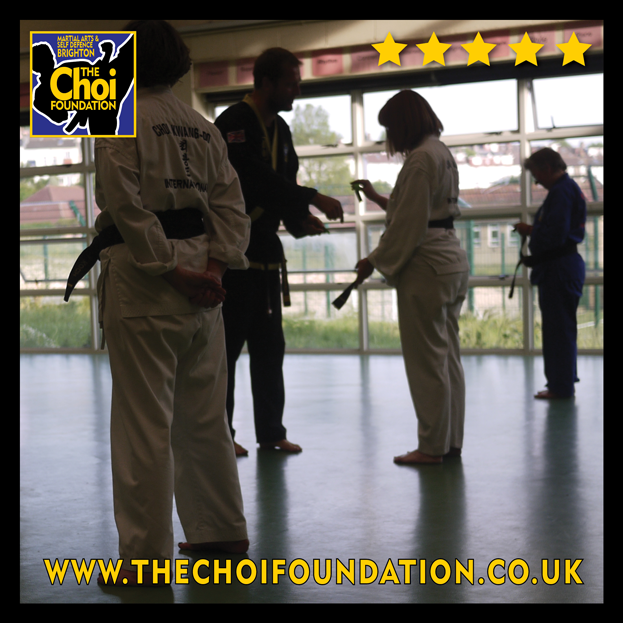 Students are encouraged to help each other to practice their techniques, again and again, ready to achieve their next colour belt. All students are encouraged to take time to give a little personal training other students. 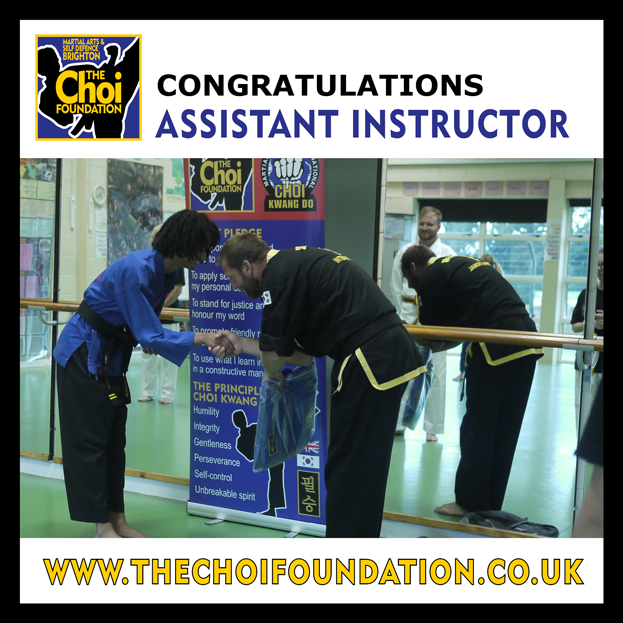 Assistant Instructor – At Gold belt, dedicated students can certify as Assistant Instructors. 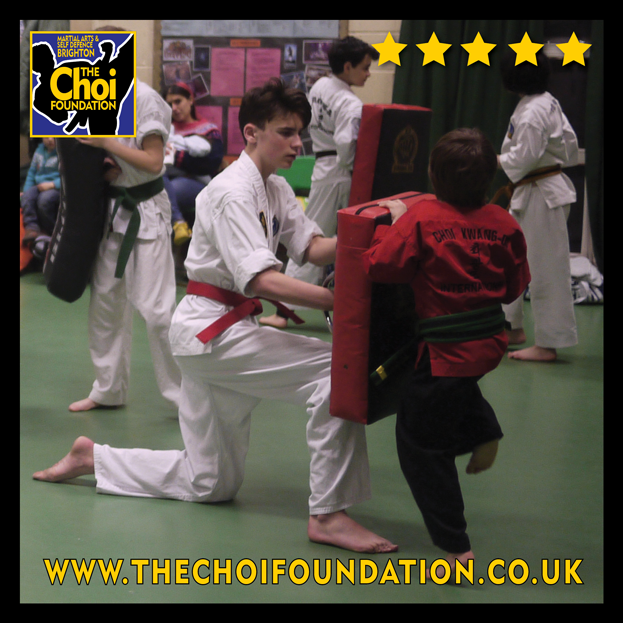 While helping others with achieving their goals in Choi Kwang Do, Assistant Instructors learn leadership skills, teaching skills and may also benefit with the privilege of accelerated promotion. 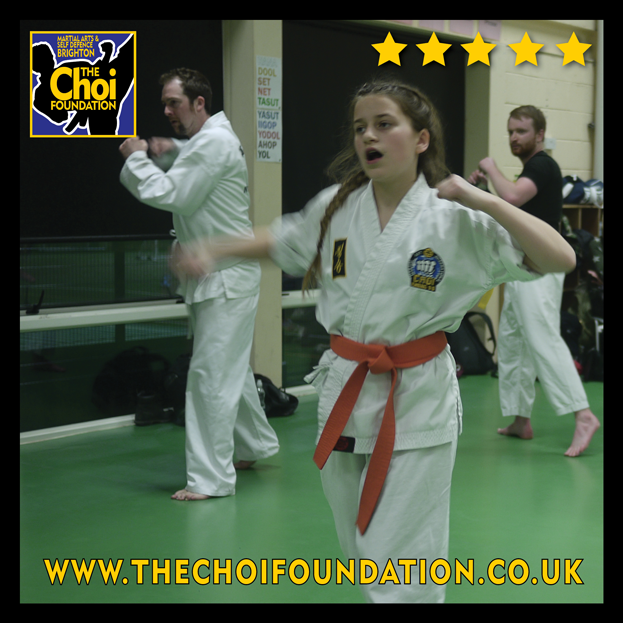 In our Martial Art classes we use our brains constantly, practising techniques again and again. 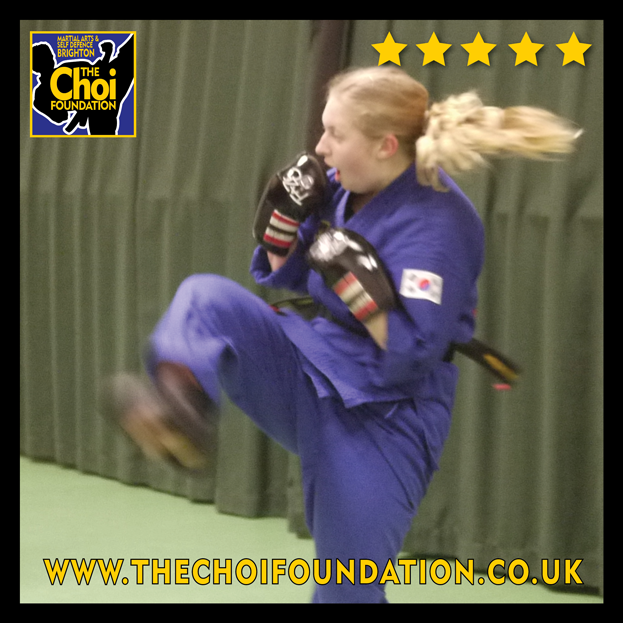 Martial Arts is body training and a combination of moves (punches and kicks) we call a pattern, used to defend yourself. 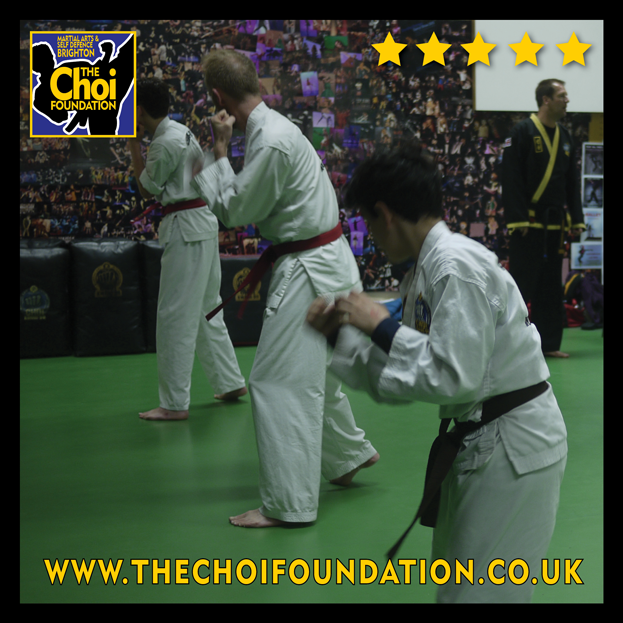 Speed and concentration is learnt by starting at white belt and moving through to the more complex belts. You could become a black belt within 4-5 years. Both are important: Aerobic fitness training develops stamina and endurance, which assists you in daily life. Anaerobic training develops speed, agility and explosive power, which is essential in self-defence. And the combination strengthens the heart and lungs. We also teach a complete stretching method designed to strengthen all muscles, tendons, ligaments and bones, and our patterns use natural, rhythmic, fluid, contra-lateral movements. We systematically train both sides of the body evenly, in coordination with the eyes, which allows students to stimulate and develop their brain as well as their muscles. Definition of Martial arts, it cover a broad range of activities that involve fighting techniques, physical exercises, and methods of mental discipline, among other skills. 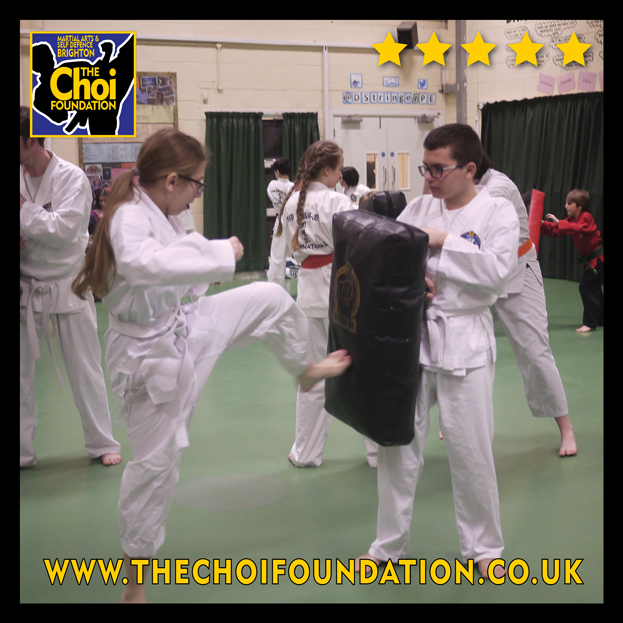 Martial arts originated in the ancient cultures of Asia, and are used today around the world for self-defense, exercise , health, spiritual growth, law enforcement, and athletic competition. 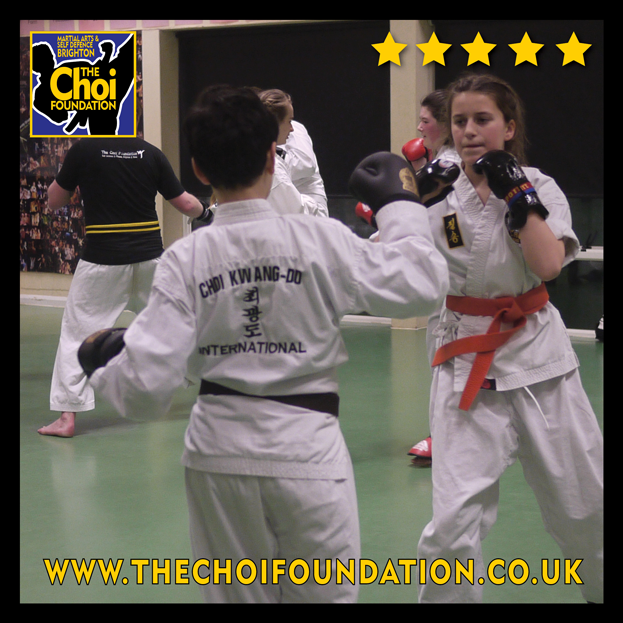 Choi Kwang Do Martial Arts and Self-defence in Brighton is physically challenging with a modern approach and in a safe and friendly environment. 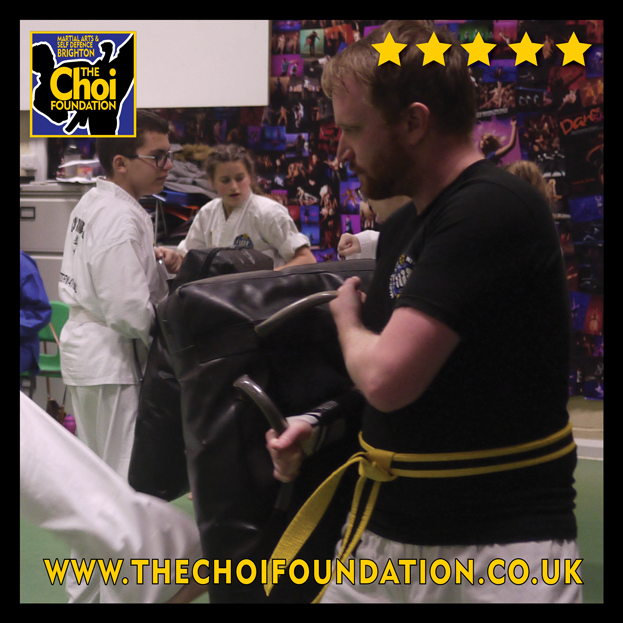 If you have never tried a Martial Art, or maybe you practice years ago and want to start again, we are confident our classes will suit your needs and abilities. 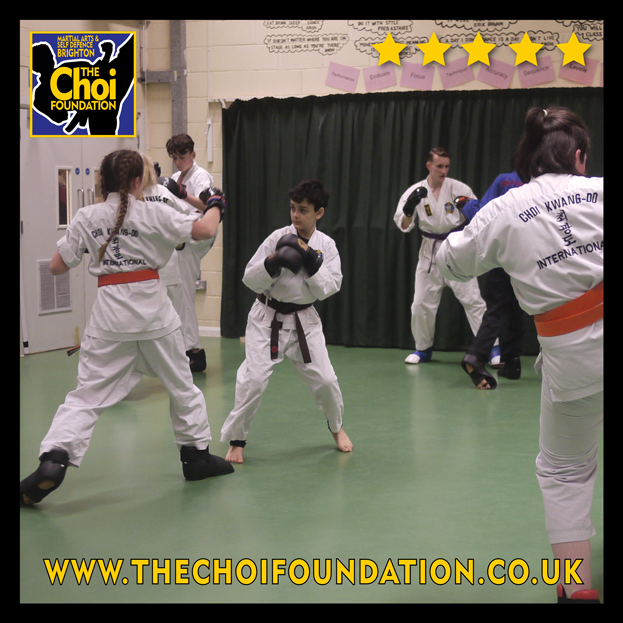 Our students want to learn real-life, practical self-defense skills and achieve a greater level of health and well-being. Fitness is the fun part of the process. Martial Arts is easy to learn, its you that adds the hard work. Come and try it for yourself.